Full professor of Administrative Law and Public Administration. He is Fellow of Oxford Center for Animal Ethics, member of Council of Europe's Group of Independent Experts on Charter of Local Self-Government, Board member of ENTO (European Netwok of Training Organizations for Local and Regional Authorities), member of Croatian Academy of Legal Sciences, member of Croatian Academy of Science and Arts' Council for State Administration, Justice and Rule of Law. 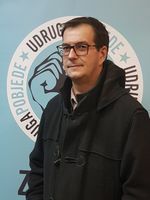 He teaches the first course on Animal Law in Croatia and has been involved in many activities of Croatian NGOs in the field of animal rights and protection.